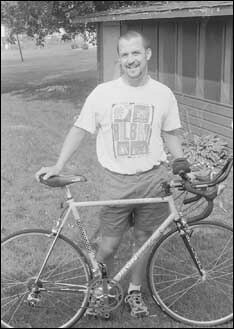 Having gone to college in Nebraska, married a woman from Colorado, and now living in Minnesota, Dan Hoey ( with his bike) is used to getting grief about his home state of Iowa. So when asked why he, along with 10,000 other bike riders, would want to pedal their way across his native state, Hoey is willing to admit, "The corn is everywhere, but I'm used to it. It was going home for me." "There are some really neat towns," said the LeMars, Iowa, native, who now teaches business at Atwater-Cosmos-Grove City High School. "It was beautiful to see some of the history in these towns,"Êhe added. In July, Hoey took part in RAGBRAI, which is the Register's Annual Great Bicycle Ride Across Iowa. The event started on a dare to the editorial staff at the Des Moines Register, and quickly grew into a sizable event in the state. This was the 28th annual RAGBRAI. Ten thousand bicyclists dipped their rear wheel in the Missouri River near Council Bluffs on the western border of Iowa and then biked their way across the state before dipping their front wheel in the Mississippi at Burlington a week later. "It was a real enjoyable week," said Hoey. "It was a lot of fun." The RAGBRAI route does not go directly east. It meanders north and south on county roads, bringing the throng of riders to small towns throughout the state. "For a lot of the small towns along the way, it's like Town and Country Days times one thousand," said Hoey. Hoey said this year's route crossed Interstate 80 ten times. It was also the second hilliest RAGBRAI, with 5,000 vertical feet of climbing. There was one fatal accident this year. The official mileage was 450 miles, or 473 miles for those who did an extra loop to make a century ride one day. Hoey said his odometer indicated he pedaled 545 miles during the week, when trips to grocery stores, restaurants, and campsites are included. Like many people, Hoey started biking as a method of transportation before he got his driver's license. Now he rides for fitness. He rode 600 miles in preparation for RAGBRAI. "It's something that I always wanted to do, and it was a challenge to me physically," he explained. "For me, the most impressive thing was the sheer numbers and the variety (of riders)," said Hoey, who saw one-arm riders, no-leg riders, and someone who traversed the state on roller blades. As for bicycles, he saw it all: tricycles, tandems, recumbents, even an old-fashioned bicycle with the large front wheel and a small rear wheel. The only type of bike he didn't see was a unicycle. He also saw a lot of partying, something for which RAGBRAI is known. Hoey didn't participate, keeping to himself, as much as that's possible amid the multitude, for the first few days before meeting a fellow teacher and joining up with a group of riders. Most of the RAGBRAI riders put their camping equipment and gear in a semitrailer that is driven to the next campsite. The logistics of RAGBRAI are complicated. To provide bathing facilities for all the riders, car washes are converted into mass showers. Up by 6 a.m. and on the road by 7 a.m., the nine riders of Team X, including Hoey, rode in a pack, which saves energy for the followers and allows for faster speeds; slept in the yards at prearranged houses; and had their own support van. While this year's RAGBRAI had mild temperatures, Hoey wasn't pleased when it rained one entire day. The silver lining was when his teammates taught him how to completely take apart his bike and clean it thoroughly. Since RAGBRAI, Hoey has already been in e-mail contact with his new fellow riders, who he senses will be life-long friends. He is already planning to ride with them again next year, and wants his wife, Becky, who teaches at Paynesville Area High School, and their two boys to accompany him.